Should You Invest in Stocks Now? The above advice would be be about worthless unless I had some data and analysis to back it up. I do. Stock Markets have crashed about 40%. It’s a fact that great businesses are on sale. Many highly profitable, famous brand name businesses are on sale at huge discounts to the prices they commanded only one year ago. This proves that stocks are cheaper than they were. But this does not, in itself, prove that stocks are either cheap nor that they are likely to recover in price anytime soon. And there is plenty of fear that stock prices are going to fall further. Lay-offs, bankruptcies and home foreclosures are much in the news. Most investors are gripped with fear and are in no mood to buy stocks. Is this actually a buying opportunity? Warren Buffett is the world’s most successful investor, ever. He has always said “Be fearful when others are greedy and be greedy when others are fearful” Warren Buffett recently advised people to buy stocks and indicated that he is selling government bonds and buying stocks in his personal account. 1. The Price / Earnings or P/E ratio rises while earnings remain the same or increase. 2. Earnings rise while the P/E ratio remains the same or rises. Are Stocks cheap now and should you invest? Warren Buffett has always said that the stock market is unpredictable in the short term but can be counted on to rise at least modestly over the longer term. If, before you are willing to invest in stocks, you require a guarantee that the stock market is going to go higher in the next month, the next three months, the next year or even the next three years then you cannot invest in stocks. No such guarantee is ever possible. If what you require is an analysis that shows that there is a high probability that stocks will be higher in five years and ten years then now may be a very good time to invest. Stocks must rise over the years if earnings rise (this assumes the P/E ratio remains relatively constant, about which more below). Mathematically, it is a fact that if the earnings rise and the P/E ratio is constant then the stock price must rise. And earnings on a broad stock market index such as the S&P 500 rise with increases in Gross National Product, GDP. This has proven to be the case historically as the following chart shows. In the above chart we had S&P earnings data available back to 1960. From this chart we can see that the S&P 500 earnings level has risen (albeit in a lumpy fashion) with GDP. It seems clear from this chart that if GDP continues to rise then S&P 500 earnings will (within a few years at most) follow suit and rise. And if S&P 500 earnings rise then the S&P 500 stock index must rise, assuming that the P/E ratio remains constant or rises (about which more below). The chart also shows that earnings are not currently at a high peak in relation to GDP. If earnings were at a high peak then we might have a period where GDP would grow while earnings did not. 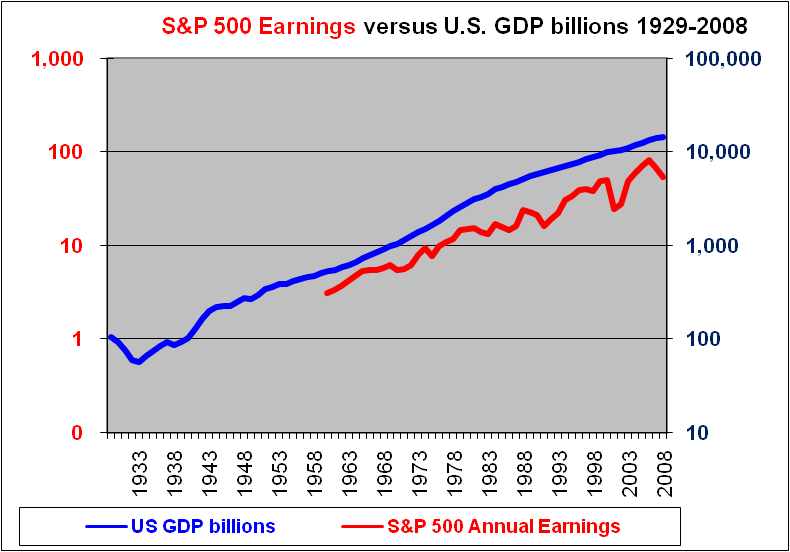 From the graph it appears that if GDP grows, then earnings on the S&P 500 index will grow. The U.S. GDP line in blue here is in nominal dollars. We are more used to hearing about the growth of GDP in real dollars after deducting inflation. In nominal dollars U.S. GDP has risen very steadily over the years. Since 1940 there have been occasions where GDP was flat for a year but certainly no dips are evident in the graph. And it appears that since 1940, it has never failed to rise over a period of about three or more years. However, during the depression years the GDP did fall materially. If you believe that there is a strong chance that we are headed for a depression then you should have a low or possibly zero allocation of investments to stocks. The consensus of opinion is that the North American and possibly the world economy is in a recession. The Stock market has already fallen about 40% and therefore may have already “priced in” the recession. It’s possible that the stock market has already bottomed and will not go lower even if the recession worsens. But that can’t be guaranteed. It’s possible that the stock market will fall further as the recession deepens. If you believe that the recession will worsen and that stocks will go lower and that you can pick the bottom, then you should not invest now and should instead position yourself to be able to buy stocks at lower levels. Before deciding whether stocks are a good investment now, it is worth examining whether or not P/E ratios are likely to rise or fall. Firstly, what is the P/E ratios for major stock indexes at this time? *The average P/E ratio on the Dow Jones Industrial Average since 1929 has been 15.5. This is based on year-end data and excludes several spikes that were related to abnormally low earnings (1982 at 114.4. 1991 at 64.3 and 1933 at 47.3 are excluded from the average). P/E ratios (of broad stock indexes) generally fell during the past few years. However, more recently due to huge losses at some companies, P/E ratios have started to increase. If the impacts of large losses at a few large companies are omitted then the current P/E ratio appears to be approximately 12. 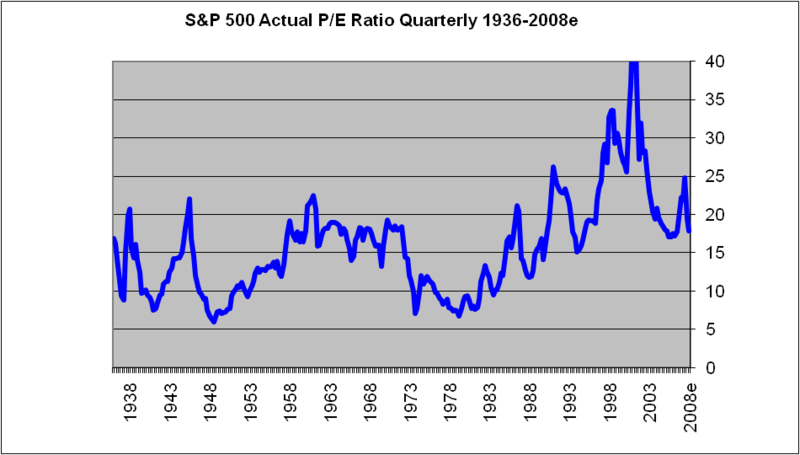 The following two charts illustrate that at 12, (or even if it is 15) the current P/E ratio is below average. The graph also shows that the P/E ratio has at times gone lower and has on some occasions remained under 10 for several years. From the above chart, and from the table above I would conclude that the P/E ratio is somewhat lower than average at this time. While it could fall further, there is no strong reason to expect that it will. Over the next five years nominal GDP will almost certainly rise (but may well stall or dip prior to that due to recession). This rise in GDP will be associated with a rise in earnings on the major stock indexes. The P/E ratio is not likely to be much lower if at all lower at the end of the next five years. Therefore stocks will likely be higher in five years. Therefore stocks are likely to give a reasonable return, when the rise in stock prices plus the dividends are considered. Therefore now is a good time to invest in stocks. But there is always uncertainty and it would be wise to be positioned to have cash to make additional investments if stocks fall lower in the meantime. What is the Fair Value of the Dow Jones Industrial Average? An update of our analysis of the valuation of the Dow Jones Industrial Average suggests that the DOW’s fair value is perhaps 9,650 to 11,400. This is above its current value of 8,944, which suggests that now may be a good time to invest. (Again this is a long-term analysis and certainly offers no guarantee that stocks will not fall in the short term). Have We Seen the Bottom Yet? While stock market indexes are down about 40% from their peaks we are also about 10% higher than the low that occurred on October 27. Was October 27 the bottom? I don’t know. I do know that it is very hard to pick bottoms. When a market is at a bottom everyone tends to feel very pessimistic and it is very hard to invest and buy at the bottom. But it is lucrative to do so. Perhaps you agree that now is a good time to take advantage of the “40% off” sale prices and invest at least some money. Until Tuesday November 11 we are offering a special discounted price on our Stock Research / Stock Picks service. This is only for subscribers to this free newsletter. Click now to subscribe at your special reduced price. Now is a particularly good time to subscribe to our Stock Picks. We have recently updated a number of Stock reports for their Q3 earnings. With the lower prices we have raised the ratings on several of these into the Strong Buy range. We will also have more Stock rating updates coming soon reflecting additional Q3 earnings reports.